Classify this story in the category of surprising Sunday dramas. 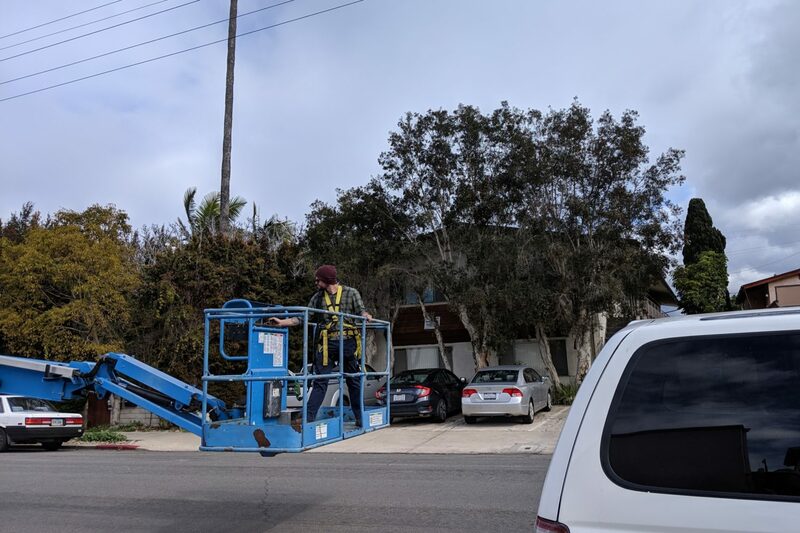 Painters have been working on our apartment building and parking their lift truck along the street. Around 11:45 a.m. PST, I saw some stranger climb onto the lift and start it up. While he wore yellow utility belts that gave the aura of authority, his presence was suspicious, because: Neither he nor his buddy was one of the three painters; his companion drove a nondescript white utility truck, while the painters’ vehicle is branded and red; and he initially fumbled around like someone unfamiliar with the controls. When the dude unparked the lift, I wondered: Is he stealing it? Off he drove down the street, with his companion following behind in the white truck. This is my neighborhood, it’s a sleepy Sunday, and I am more curious than a cat. I had to follow, first on foot and then by car. The pair drove about 1.8 km (1.1 miles) through University Heights to Rhode Island Ave., which is nearby an area called The Point and overlooks a canyon leading into commercial area Mission Valley below. They stopped, by the overlook. The lift raised to its absolute height, and the dude appeared to take photos with his smartphone. I swear! Minutes passed. 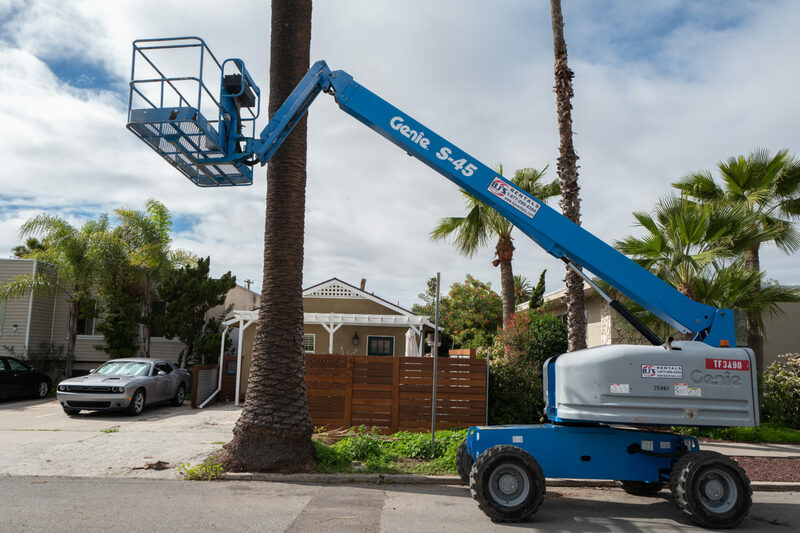 The photo session finished, he started up the lift truck, the pair trapsed back along the same route, and he returned the vehicle to where it had been parked. What convinced me about a joyride: The dude had a giant grin—teeth gleaming in the sunlight—as he and his buddy drove away in their white getaway vehicle. I shot the Featured Image at 1:18 p.m., using Leica Q, seconds after the joyriders left. Vitals: f/5.6, ISO 100, 1/640 sec, 28mm. The second photo is a quickie taken with Google Pixel 3, along another street. Vitals: f/1.8, ISO 68, 1/3356 sec, 4.44mm, 1:08 p.m. CONFIRMED! Joyriders! I spoke with the lead painter on the morning of February 11. No one was authorized to use the lift truck. He had left the keys in the ignition because the rental company was supposed to come for the vehicle on Saturday (2/9). Update, April 6, 2019: The painter showed up at my door today asking if I had photos of the joyride. Apparently, the rental company charged him for extra gas usage and didn’t accept his story about the unauthorized jaunt. I asked that he use this post as proof.